I’m walking back to our house. Deep in thought about some computer code for one of my customers. A lady in traditional Peruvian dress on the opposite side of the street looks a bit upset or out of place. She’s carrying a baby on her back. She’s yelling something I didn’t understand right away. I’m still in my own world. A young man – maybe still a teenager – walks by quickly, his head down. The lady’s yelling louder and more clearly now. RATERO! RATERO! Other people in the street are looking up and start yelling as well. RATERO! RATERO! The young man starts running down the street. I finally snap out of my own world. “Ratero” means “thief”. Apparently the guy had robbed something from the poor lady but she was alert enough to notice. A bunch of people are now running after the ratero and a bit down the street they catch up. I was mad at myself. I missed my chance. If I hadn’t been in my own world so much I would have stood a decent chance of being the first to catch this little robber. I didn’t stick around too long but it looked like all ended well for the poor lady and the little robber was about to get what he deserved. In 4 years here in Peru this was the second time that I witnessed a public chase after a ratero. Unfortunately both times I was just too late to run after the guy myself. Peru is generally a safe country but petty crime is quite noticeable and people are understandably upset about it. You can probably argue that in the most recent Peruvian presidential elections the final vote came down to the 2 candidates that were perceived as the toughest on crime. We regularly hear about break-ins and the like. It’s happened to friends and neighbors. At Patricia’s work there’s always a line of people looking to buy new cellphones because their old one got stolen. The only thing I’ve lost to a ratero was a camera about a year or so ago. That was my own fault because I was in a large crowd and put the camera in an open pocket. More recently kids took a ball and a little purse that belonged to Brianna but again it was my own fault because I left the stuff unattended in the park while Brianna went to play in a different area. The rateros like to “case” houses pretending to be utility company employees and the like. They prey on empleadas (maids) who are home alone and may not know any better. One guy came to “case” our house pretending to be with the gas company. I let the dogs out and haven’t seen the guy since. Patricia laughs at me and thinks the dogs won’t do anything if a ratero came to our house. Maybe that’s true but even the appearance of security alone is typically enough to make the ratero move on the the next house. Quite frankly most Peruvians don’t have any experience with strong protective dogs (the street dogs are generally skittish) and I have no doubt in my mind that our mutts would put the average ratero in the hospital for a very long time – especially if any of us are home. The little dog is a Jack Russell mix and hates everyone but me. 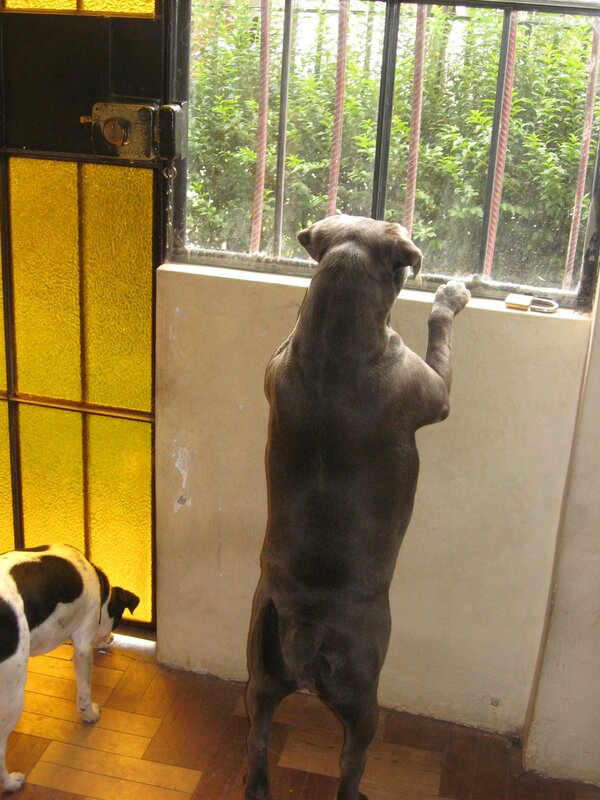 The bigger dog is a Blue Pitbull and has never had an original thought in her life. She just does whatever her “big sister” does. When the little dog gets mad the big dog gets madder. The big dog is mild mannered and timid by herself, but the little dog isn’t scared of anyone. I’ve seen her get mad at 10 people or a Mastiff that outweighed her by 140 pounds. Of course petty crime doesn’t just happen in Peru. My father was working in his garage in Belgium one day when a thief snuck up beside the house and stole a bicycle. I got pickpocketed at the Atlanta airport once. When Patricia lived in Ohio some guys came to “case” their neighborhood. I guess it happens everywhere. If you’re visiting Peru some ideas for your safety/security are just be alert and watch your belongings while you’re in crowded places or on a bus. Don’t be a dumbass like me and walk around Inti Raymi with a camera in an open pocket. Be alert at the bus stops, people will enter the bus to sell candy and drinks, or from outside through the bus windows. Rateros will enter the bus to steal your stuff while you’re distracted or asleep. Don’t flaunt expensive jewelry or electronics, don’t leave your belongings unattended, common sense stuff like that. This entry was tagged crime, Manchita, Peru, ratero, Roxi, thief. Bookmark the permalink.